Death is the undiscovered country, and The Temple is an expedition to map the unseeable. We’re suspended between all territory, in a sunken German U-boat toward the end of World War II. Karl Heinrich is what a later era would call our point-of-view character, though there’s no making sense of what we see through his eyes. Escorted as a VIP by the submarine’s cynical and demoralized crew, he’s the outsider who brings fresh perspective, though there is no outside in the contracting madness of this vast, cramped tomb. That a Nazi true believer on a boatful of non-believing butchers is the figure of reason shows how irreparable the ship’s and its state’s moral compass have become. The men (played by a remarkable ensemble as weary, weathered lost souls too dischordantly perfect to single anyone out) operate like the guts of the machine they inhabit, armored and smothered like the paranoid Third Reich, acting as one but fraying into squabbles and accusations and brawling like the gears of a clock grinding into immobility, periodically speaking in unison or sounding recurrent thematic refrains in Nat Cassidy’s intricate script, a kind of funerary chorale. Imperial transgression was a theme of the H.P. Lovecraft story that inspired the play, materialized similarly here in two mystic totems whose theft from a strange half-dead refugee of some unknown cultural origin triggers grave consequences from alien forces; Lovecraft may have been one of the inventors of this trope but he too knew it was just one of the trappings of the sufficient monstrosity within the human imagination. The ship’s doomed mission and pointless cause are made plain, while nothing is simple about the enormity of the destruction these men are part of; the monumental and intimate atrocities of 20th century warfare and the presumptions of superiority it grew out of in the age of monarchy (and into, in our own barbaric present) defy rational analysis. 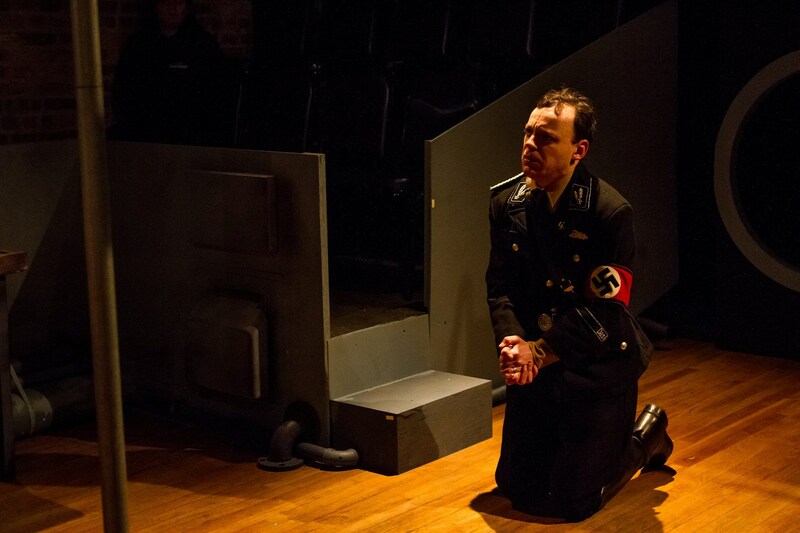 And as Heinrich, Matthew Trumbull gives a performance of titanic existential dissonance, at once bemused and recriminating, as he channels but does not explain the ghastly absurdity around him. That horror is radiating from the crew as it pushes in on them from the exterior, and occasional insights leak from Heinrich and the men like bubbles to the surface of a consuming sea, flickering shafts of light we try to hold our view of. Awareness is possible, but the odds against it are nearly incalculable. 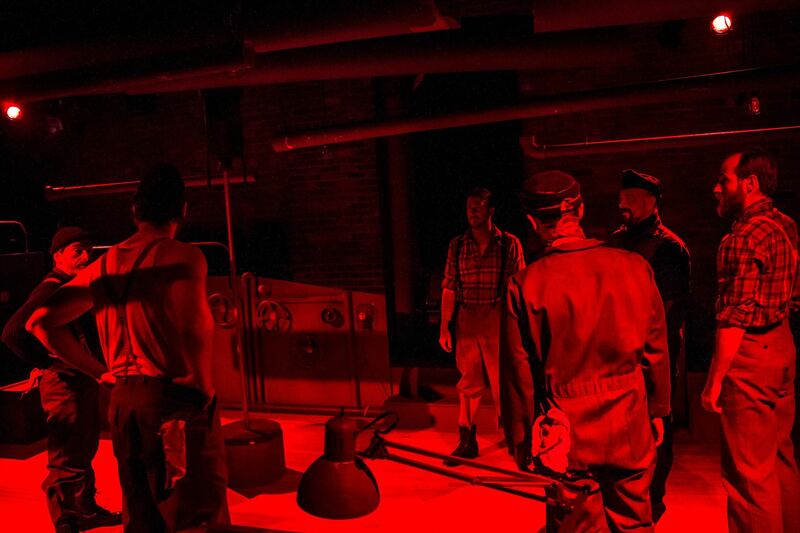 Saundra Yaklin’s set design brilliantly enforces the claustrophobia, placing the audience around the stage area’s corridor-like space to mimic the Jonah’s-whale ship interior, seating us like juries over the action and under each other’s scrutiny. Morgan Zipf-Meister’s lighting shapes the space and paces the ordeal in a catastrophic choreography, as failing lanterns strobe manically or emergency lamps wane like breathless candles. 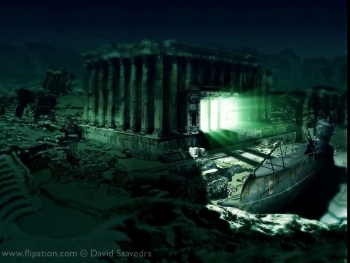 Belief once meant confidence in what’s beyond understanding, not commitment to what makes no objective sense, and Heinrich repeatedly tells the men to “have faith” or that “I believe in you.” The temple of the title, the center of a lost undersea civilization from the Lovecraft story, is seen here as a phantasmal shadow of meaning, but as the play ends on a masterful note of narrative suspension you should witness for yourself, it’s clear, and inescapable, and maybe even reassuring, that there’s always a longer way down. This entry was posted in history as nightmare, hitting bottom, tell no tales on February 26, 2015 by adammcgovern46.